Illustrated with over 1700 colour photographs and figures.Brian Leatherbarrow, FRCS, FRCOphth | Oculoplastic Surgery 2nd Edition Textbook | Manchester UK | Cheshire UKThis lavishly illustrated textbook offers the reader a pragmatic approach to the diagnosis and management of patients presenting with a wide range of oculoplastic, orbital and lacrimal problems. Although aimed primarily at the ophthalmologist, Oculoplastic Surgery will also be useful to clinicians of all grades and experience in allied specialties e.g. plastic surgery, facial plastic surgery, maxillofacial surgery, ENT surgery, dermatology and radiology. In addition to providing descriptions of pre-and postoperative patient assessment, Oculoplastic Surgery also gives detailed explanations of the causes of operative problems and complications. Emphasis is also given to investigations, surgical indications and important technical considerations. The reader should already have acquired a basic knowledge of eyelid, orbital, and facial anatomy and should seek to expand this knowledge as much as possible. As the eye, periocular area and orbit represent a major crossroads of surgical anatomical dissection, the surgeon who wishes to contribute to this field should acquire a very detailed knowledge of the anatomy of this area and its adjacent structures. Applied anatomy relevant to each disorder and to each surgical procedure is presented in a dedicated chapter and the operative procedures described are based on anatomical principles as much as possible. Important principles are highlighted in the text as key points in boxes. Pertinent clinical signs, investigations, surgical indications, important technical considerations and complications receive appropriate emphasis in each chapter. 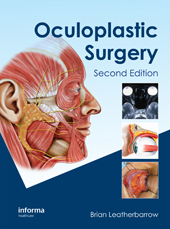 The surgical techniques and procedures described are not exhaustive but represent those most commonly used in the author’s own surgical practice. The text is accompanied by a considerable number of high-quality colour photographs and complementary original colour illustrations.The 3rd edition is due for publication in late 2018/early 2019 and will have links to videos of operations.